So nice to see something moderately original in aviation photography. While faithfully pursing the end of the internet, I stumbled upon this photo and it shouted at me. 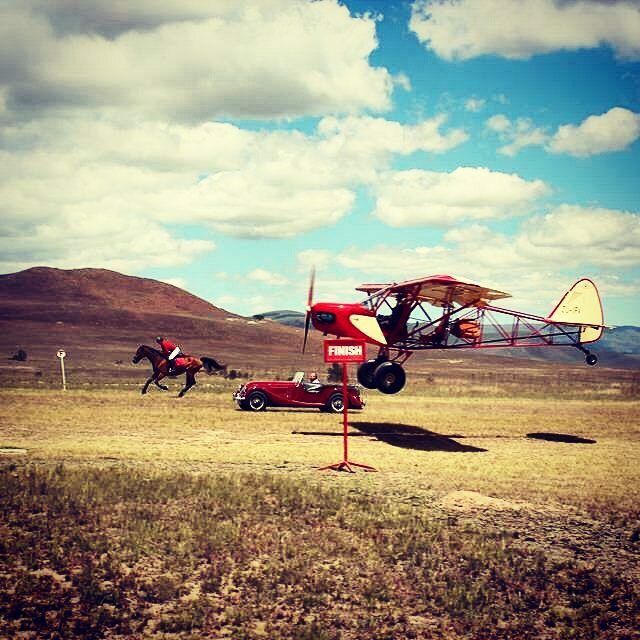 A horse, car, and airplane racing cross the finish line. Wow, that's cool! The color isn't great, nor is the composition. And the overall feeling of the image is that a bystander took it without any forewarning of what was going on. Yet, to me it's a more moving image than 90% of aviation photos taken today by professionals. When civilian aviation photography took off in the 70's, the big thing was air to air images. A good prop blur came along with it. 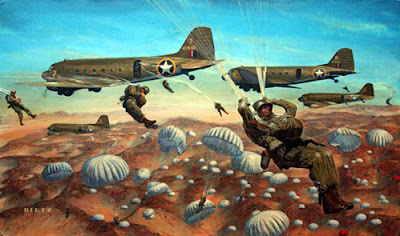 Shortly thereafter it was head on shots (air to air) of warbirds taken out of B-25s. Then it was formation air to air, unique angles, and sharper images. Then came the prop disc, aerobatic planes in different attitudes, aerobatic planes in formation in different attitudes, planes ghostly lit on the ramp at night, the occasional plane overhead an event, and wildly varied planes flying together. When you combine like compositions and traits, you have formation air to air, big fancy prop blur, and different attitudes plus different aircraft; that's it. There's no shortage of aviation photos but there's a big shortage of something different. We need different. We need art. Ask around and many photographers will tell you what they do is art. I think it's photography. I'm not taking away from what they do. I merely think they are confused about what art is. Yes, I know art is subjective. But when it is all boiled down, there's a difference between photos and art. Art either tells a story or it forces your mind to create one. Think Dietz if you're confused. Most of today's aviation images are little more than micro PR campaigns designed to make the pilots and photographers look cool in order to sell magazines to the simple minded. Observe how easily a corrupt politician can convince people to vote for them over and over again and you'll see how handily people can be impressed by an image. That's not to say our photographers don't have it in them to create art. They simply do not feel the need to and they may have a point. One of my favorite quotes is from a book about business. In it is a story about a highly skilled author who is pissed off about and insulting a less skilled author who had been receiving awards for his "lesser" work. The author receiving the awards stopped the complainer and said, "Notice, the award says best selling, not best written." When you can make money and build a reputation by doing something easier, most are going to do just that. Unfortunately, when it comes to airplanes, simple only relates to the people of aviation. Notice the image at the top. It has fans of beautiful scenery, horses, cars, and planes as potential customers. If one of the three unrelated to aviation were to hang it on their wall, there would be a new home into which aviation had poked its head. Art speaks to people and makes them think. Art opens news minds to new things. Photography may elicit reactions but nobody thinks deeply about a Corsair flying with a Citation. Create something memorable though, something that tells a unique story, and people will never forget it. I would love to see some our best give it a shot. They certainly have the talent. I was a "picture-taker" in the Navy for 14 years. Did my last 6 as an air traffic controller (mostly at NAF El Centro) before retiring in 1987. If you want "boring", take a look at the plethora of "official U.S. Navy" photographs (although today's MC's - Mass Communications Specialists - put a bit more human factors in their photo, than the typical "grip-and-grins" of the PH -Photo Mate - days; but that's another story altogether). I think people are the missing element to telling a story. when included in a photo, no matter how small their scale, LIFE is breathed into it. You linger, as your eyes wander throughout the frame; while your brain puts these elements into motion. In spite of today's general "picture phobia" perpetrated by the "terrorism thing" of 9-11, I hereby resolve to be brave, courageous and bold; to roam the streets with my refractive "weapon" of choice, and start making "storygrams" to post on my "Instagram" page. Great comment "Foggy." Thanks for your input. A ramble through the A/C factory & maintenance photos of yesteryear are some of the most fascinating as they generally have much to impart.